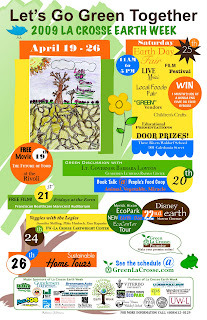 In my community Earth Day is not just a day, but a whole week of activities. Earth Week is chocked full of learning activities and fun events geared toward opening your mind to a sustainable lifestyle. 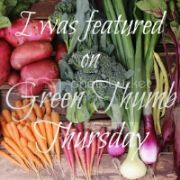 There were environmental films daily, introductions to farmers' markets and CSAs, dumpster dives, a green discussion with Lt. Governor Barbara Lawton, a book talk of Animal, Vegetable, Miracle by Barbara Kingsolver, tree planting, sneak peek tours of the new EcoCenter in Myrick Hixon EcoPark, sustainable forums throughout the city, "Veggies with the Legies" - a public Q&A with state legislators over local produce, sustainable home tours, marsh cleanup, local foods fair, and of course the Earth Day Fair - which is a day full of events in itself. All I can say is "Thank goodness Earth Week is over!" It is not that I am against Earth Day, but as the event coordinator for the week it did little in the way of making my life sustainable. In fact, it had the exact opposite effect. Months of relentless planning led to many meetings and trips into town, many many hours spent at the computer answering emails (upwards of 50 per day), an insane amount of printing, less and less time with my family, stretches of days without stepping foot out of the office, dinners of processed food and eating out, ingesting highly caffeinated sodas in plastic bottles to push through the two stints of over 36 hours with no sleep, increased electrical usage while toiling away until the wee hours of the morning, throwing wet laundry into the dryer, purchasing conventional cleaning products, leaving no time to plan and prepare a garden - Ugh, the list goes on and on. What the hell happened? Here I am scheduling events like free screenings of The Future of Food, Fridays at the Farm, and The True Cost of Food, all focused on the importance of local sustainable agriculture and at home I am serving up well balanced dinners of corn dogs, pizza rolls, frozen fish, and french fries. Ketchup counts as a vegetable, right? Wash it all down with an unnatural shade of orange soda and you have your fruit serving, too. No wonder I feel like crap! I never realized how much the choices I made affected my overall well being until drastically altering my lifestyle and then going back to the way it was. This sugar laden, nutrient lacking, overworked lifestyle used to be my normal. I thought nothing of it. That is just the way it was and I thought I felt fine. Sure I was tired, but that is because I worked a lot and did not sleep well at night. Right? I just took note that before Earth Week commenced I was routinely going to sleep at 11:00, sleeping through the night and waking up refreshed - without a midday nap. Could it be that a home-cooked meal, a moratorium on caffeinated beverages, and a balance between work and family was the cure of my insomnia? Other ailments of my former life resurfaced this past month: back pain, that golf-ball sized lump between my neck and right shoulder, burning calf muscles reminiscent of my retail days, swollen fingers, acne, excessive oil production of the forehead, hair falling out, grey hair, cotton mouth, repeated sties in both eyes, nausea, lack of appetite, irregularity - again, the list goes on and on. What a wreck! Much of my life is spent on the go as I volunteer a lot and usually have multiple projects in the works, but I have not felt this run down since I left the corporate world and embarked upon a more eco-friendly, simple, sustainable life. If anything, Earth Week has taught me that the everyday choices we make do make a big difference. It took me over a year of diligent meal planning, conscious shopping, mindful eating, resource conservation, and increased awareness to realize that life as I knew it was not "normal" and could be so much better and only a mere month to undo it all. This past month has been an exhausting and enlightening one. I have become aware of just how fragile our world and lives are. We must learn to take care of each and then they will take care of each other. Exactly how it goes here too when I'm overrun. Mum has exhausted herself in the garden, too tired to cook, let's get takeout. So NOT the plan! I've thought about doing better this year, maybe the children will cook in exchange for not having to weed??? Better scheduling should work in theory, too bad real life isn't theoritical! It's dangerous, isn't it? We get so busy working on a cause that we forget the most important cause - taking care of ourselves and our families. I've been a bit guilty of that this month.